Washington’s stranglehold over financial markets can be partially explained by the fact that all oil exports are conducted in US dollars. 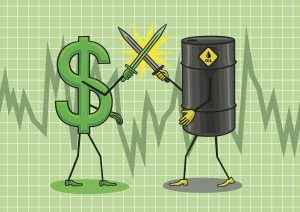 This relationship between oil and currency gives the dollar its value, as this paradigm requires all exporting and importing countries to maintain a stock of US dollars. An endless demand for dollars means an endless supply, and the US can print as much paper as it wants to account for its imperial ambitions. No other country can do this. But several countries have announced they will no longer be using US dollars for oil (Iraq, Venezuela, Iran, Qatar), and Russia recently announced that it will approve legislation to ditch the US dollar at all Russian seaports by next year. China is also on board with this proposal, a game-changer for the oil industry. Both Russia and China have been buying huge quantities of gold for some time now. Russia’s present gold reserves would back 27% of the ruble money supply—far in excess of any other major country. China is also implementing the Silk Road project, which is a major push to create a permanent trade route connecting China, Africa and Europe. One must wonder how much control over these transactions the US will have. Clearly, there is something sinister at play here, and whether or not it is tied solely to a psychopathic currency warfare remains to be seen. But the US dollar is slowly being eroded, and as these adversarial countries make developments in unison, there appears to be little the US can do without risking an all-out world war.